Summary: A productive week. Jon made up and installed 2 diesel fuel manifolds up forward, next to our new tanks, and 2 back in the engine room. Jon also replaced the fiberglass rods in our trampoline supports with longer rods of the correct size. Amanda joined Jon in assembling the mixing valves for the bathrooms. Houa finished epoxying in teak planks into our cockpit table and the 2 halves were wrapped up and stored. Then he started repairing the teak lattice between our trampolines. 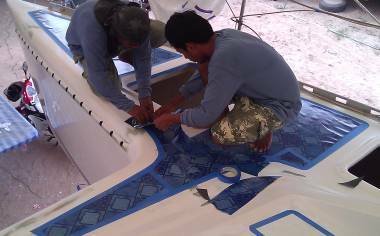 Pla and Lek moved around the topsides, filling gelcoat pinholes and wet‑sanding with ever finer grades of sandpaper. Baw and Yoong, and Nut and Bank before they left the team, scraped off almost all of the gelcoat that had been sprayed on the decks, a huge job. Sometimes it was underlying filler that came off, but sometimes it was just the gelcoat, obviously sprayed on inadequately prepared surfaces. Baw and Yoong then sanded the edges to fair everything in, and put down thick vinyl where the nonskid will go so they know where to walk and where not to walk. P'Wat showed up to prepare the cockpit and sugar‑scoops, but he also didn't prepare the (epoxy) sugar‑scoops adequately, and the filler he put down was very soft, so Mike took over those jobs. Hem, our mechanic, arrived and removed the raw water pumps from the engines so he could install better impellers and seals. Sue finally got her cast off, but her arm still hurts and she can't work with it much, although she documented our progress and sanded some mast bits. The filler on the transoms was ground off and replaced with several layers of fiberglass and phenolic filler. Amanda continued polishing the forebeam and the spreader bars. On Sunday the spreader bars got a good coating of Nyalic, and much of the mast got a second coat. It was a slow Monday, and we were disappointed that Boy and Kit didn't show up like we had hoped. P'Wat did arrive, just before 9am with 2 women all ready to work. Sue greeted him in Thai, then, thinking he understood a fair amount of English, proceeded to apologize for the confusion on Saturday, saying that the epoxy jobs on the steps weren't finished. But today they are! He said, "No problem, Madam." Sue turned away, and the next thing we knew, P'Wat had left, with the women! Oh dang! We can only guess he didn't understand the past tense, and thought that we were not ready for his workers today, either. So, with the cockpit free of sanding and cleaning people, Jon continued with the engine and diesel projects. He built 3 (of 4) cool diesel fuel manifolds, 2 for the forward tank areas, and the other for the port engine room so we can select which tank to draw from. We'll even be able to draw from the opposite side, something we've never been able to do. The 4th manifold will go in the starboard engine room, but it still needs to be assembled. Jon's next job was to run the cross‑over hose that will allow the port engine to draw from the starboard tanks or the starboard engine to draw from the port tanks. If we're motoring for any distance, it's much more efficient to only run one engine. Running the cross‑over hose involved some time in the engine room (read hot and sweaty!) 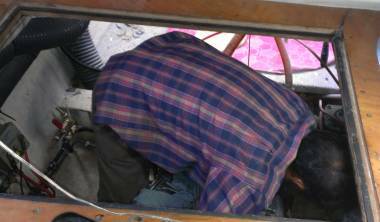 and a few minutes in every boat boat owner's favorite position: upside down in some very cramped space trying to stuff a hose into small holes. In this case, Jon was in the aft cockpit locker. Pla and Lek found the last few pinholes to repair on the starboard topsides, and moved into the inner aft topsides where they located a few more little holes to gelcoat repair. Baw, Bank, Nut and Yoong were on the cabin top chipping away at gelcoat again. 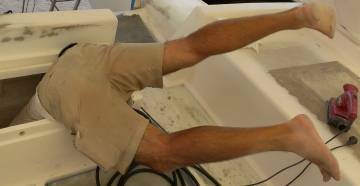 Baw found the worst area back by the companionway, where our new gelcoat just slid off the substrate beneath it. Poor sanding? Poor cleaning before spraying? Hard to say on this area, as the substrate appears very sanded and clean. Yoong used the dancing sander to fair in the edges of the gelcoat to the deck, and it's looking hopeful that we'll be able to get a new spray of gelcoat to stick! Keeping the whole cabin top clean (once we GET it clean) is the challenge in this dusty, dirty yard, where everyone leaves brown footprints. Amanda got well acquainted with the spreader poles again today, finishing off the polishing the 3rd of 4. She and Sue also took the spreaders they'd carefully coated with Nyalic and wrapped them up (for protection from scratches and dirt) and carted them off to the storage room for safe keeping until it's time to assemble the mast. Sue was the general camera and cleaning lady today, vacuuming up the gelcoat chips and dust off the cabin top as the guys worked up there. A morning of deep frustration, but the day brightened up as it wore on. First we were disappointed to not have Kit and Boy with us. But perhaps we have to learn to be disappointed. They are great workers when they show up, but we also know they're not very reliable about that. Much of the world (including much of Thailand) doesn't have a western work ethic. Still, we hope they come soon. We were happy that P'Wat (who we'd sort of confusingly scared off on Monday) arrived bright and early, although he came with only 1 other worker, not the gung‑ho women workers he'd brought before. Mike from AME was there to get things started, so we thought all was well. But 15 minutes after Mike left Sue realized that P'Wat had already applied gelcoat filler onto the flat sugar‑scoop areas between the ladder grooves. No way anyone could have sanded those areas thoroughly, cleaned them with acetone, waited the minimum 5‑10 minutes, mixed the filler and have it paddled onto all 3 areas on port sugar‑scoop in only 15 minutes! Someone was taking disastrous short‑cuts, the kind that are currently costing us hundreds of dollars in re‑do time up on the cabin top. We also found that P'Wat was using gelcoat with silica and micro‑balloon filler in it. He said he's used it often on other boats, but this is exactly what gave us so much trouble earlier on. Several months ago, at Mike's prompting, we told our guys that gelcoat (which already has filler in it) is to be left as is, and any filler should be made up from pure resin. Gelcoat with additional fillers gets too weak and too porous. P'Wat is not employed by us, so we called Mike who said he'd be by in the afternoon. The one good thing that happened on the cockpit prep was that P'Wat and his side‑kick applied another layer of epoxy resin to the areas with blue paint showing through. This had already been done once, but with a bit of heavy sanding that 1 layer of epoxy may not be enough to create a barrier between paint and gelcoat. Now we just have to hope that the areas were properly sanded and cleaned before the epoxy was rolled on. Team Hacking just can't run herd on everyone all the time. Pla and Lek (who don't need supervision, thank goodness) were still finding and repairing and sanding little pinholes in the inner topside gelcoat. After gouging out the pinhole, they clean it, dab in gelcoat, let it dry, then sand down the bumps with 800 grit sandpaper. From there they move up the polishing scale. Up on deck we had Yoong once again wielding the "dancing" (orbital) sander with 60 grit to fair in the good gelcoat with the surrounding deck in preparation to repair the areas where the guys have chipped up the new gelcoat. The chippers were Nut and Bank, once again. Baw was missing from action all morning, which added to the frustration, but he appeared just after lunch. Baw worked on deck a bit, but then Jon pulled him off that job and set him up working on strengthening our new transoms. When the transoms were finished, Baw shaped them with white filler above the waterline, and they were waiting to receive phenolic filler below the waterline. Now we realize this makes them too vulnerable to cracking if/when someone bumps into our stern in a dinghy, a very common occurrence. It would also be important if we backed into a dock, but those few times we go into marinas we much prefer to go bow in, as it gives us more privacy. Still, we decided it would be better to get the (relatively fragile) filler off, and make both transoms all fiberglass. But the straight line of the filler across the transoms has been our reference for where the antifouling paint will go, so first Jon and Amanda used the laser to transfer those marks to under the bridge‑deck, where we scribed them into an area that has already been polished. Then Jon and Baw ground off the filler, cleaned the transoms up, and Baw epoxied on several layers of fiberglass. 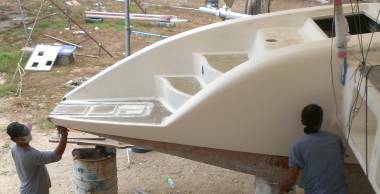 Tomorrow we'll sand the transoms to the correct shape and make them ready for gelcoat. 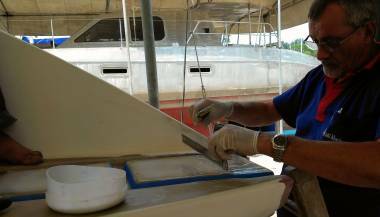 For a while, Jon joined the guys scraping poorly adhered gelcoat from the cabin‑top. There's a strange satisfaction to removing that which isn't perfect, even though it means spraying the gelcoat again. We certainly don't want this stuff coming off in a year. Jon also futzed with his port aft diesel manifold. One of the valve handles was interfering with a fuel filter so the whole manifold had to be removed, the offending valve taken off and turned around, and then the whole thing reattached and put back. Looks like it should work better now, but it still needs to be fastened to the wall of the engine room. Jon also started designing the manifold for the starboard engine room, which should be less complicated. Houa got to within 95% of finishing cockpit table project but took off early, with our blessing. His next project is to re‑make the long lattice‑work teak platform that goes from the deck forward to the forebeam, over which the anchor chain used to travel. It is terribly worn by the anchor chain, to the point that tacks stick up and catch your feet. Now that we've moved the anchor so it will be aft of the teak lattice, it makes sense to repair the lattice so it looks nice again. Houa calculated his teak needs, called the supplier to get prices and presented us with the info. He asked to leave early to be able to travel half‑way up Phuket this afternoon to buy the teak. He will take it home, then be able to arrive at the yard with the teak at the usual time tomorrow morning. 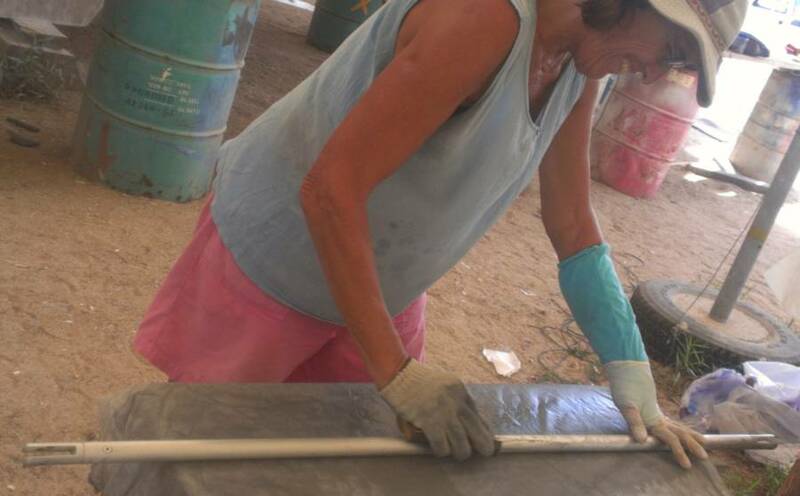 Amanda uncovered the forebeam which had been partially polished weeks ago, and was able to make good progress polishing the big triangular A‑frame that sticks up to brace the forebeam against the pull of the headstay. Sue put a latex glove over her left arm cast to keep the water out, donned a cotton glove on the right hand and got 2 more spreader poles sanded. Tomorrow the cast is due to come off! Yay! Time to see the zombie arm! Mike returned to the yard 2 hours after P'Wat left to see how the work had gone. He was not happy when he found he could easily scrape P'Wat's new filler off the sugar‑scoops. We all took turns ranting for a bit, then realized it was beer‑o'clock, so a few Tigers later, we were all ready to face the evening on a more even keel. Such is boat work in Thailand! The best news of the day was that we have firm plans for a Sunday pool party up in Ao Po with several cruising buddies, all gathering to celebrate Jon's birthday on April 7th! Nice to be at mid‑week already, but it was a bit of a slow day, with only Jon holding down the fort until mid‑afternoon. Amanda chauffeured Sue to the International Hospital where the orthopedic doctor took a grinder‑looking tool and sliced off Sue's cast. Given all the boat work that involves nasty cutting/grinding tools, Sue was a bit apprehensive, but she survived with no more than a few momentary flashes of heat as the wheel got too close to the skin. She now has a zombie‑arm, lots of dead and dying skin, and red blistered oozing sores from the retained sweat. "You got it wet," accused the doc. Right. 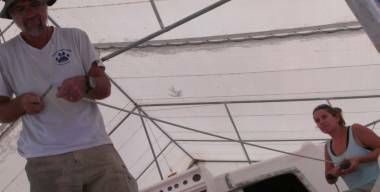 What did he expect with 8‑9 hours a day in the boat yard for a month, in temperatures over 39°C (about 100°F). Yeah. It got wet in there. 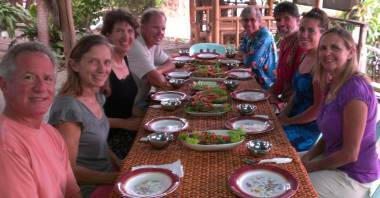 Most "farang" (foreigners) with casts probably either fly home to cooler weather, or stay in air conditioned rooms for a month. Not Sue. Baw spent much of the day improving our transoms, first sanding smooth the epoxy and fiberglass layers he put on yesterday. He laid up more fiberglass to give us nice vertical transoms and wrapped the glass around the sides a bit. They look great now, and they certainly give us confidence in their strength and ability to withstand an inadvertent smash by visiting dinghies or Thai long‑tail boats! Once the transoms were glassed he joined the chipping team up on deck, working on the port side of the cockpit. Lek and Pla, our steady topside polishers, were back once again on the starboard side, now sanding with 1200 grit sandpaper. Yay! We're getting back our shine, and all the little pinholes seem to have been properly filled. Houa arrived in classic Thai motorbike style, with many kilos of teak boards strapped alongside. These big teak pieces, some 8" x 2" x 9' long (20cm x 5cm x 2.5m) will be used to repair the teak lattice‑work on the chain platform between our trampolines. But Houa's first job of the day was to finish the cockpit table top, which he did! He even added new wood to back up the hinges. Every teak join is beautiful and lovingly handcrafted. Jon spent several hours battling the corroded‑in screws that held plastic panels on the walls of the anchor well. The propane torch didn't help and after breaking 3 drills trying to drill out the screws, Jon was glad to see our local machinist, Chai, arrive. Chai was bringing back the 7 stainless steel hinges for various cockpit hatches. These 7 hinges have a total of 33 studs welded on, 13 of which had broken over the years. Chai drilled out the 13 broken studs, tapped new threads into the holes, welded in new studs, and polished up the tops of the hinges so the welds don't show, all for only $45! Chai offered to get those screws out of the anchor chock, but maybe not until after Songkran, the Thai New Year celebration which runs April 14‑18. 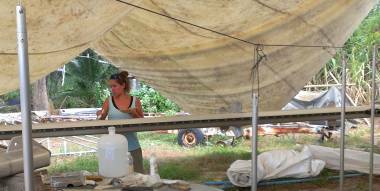 Once Amanda arrived, she and Jon spent time improving our plumbing situation. They finalized the design of the starboard aft diesel manifold, built it up, and then installed it. Then they went over to the port side and finished installing the diesel manifold on that side. Talk about hot and sweaty. Not a breath of air in those engine rooms. They also discussed some of the other plumbing projects, and what additional supplies we still need. Those were obtained after dinner, at our local Home Pro fancy hardware store. Another hot day at the yard, but at least it rained last night so the sand was a bit firmer to walk on. Team Hacking was in early, ready to meet with Mike, K'Wiwat (owner of AME), and P'Wat, the preparation and gelcoating subcontractor. Mike arrived, followed by P'Wat, but unfortunately K'Wiwat himself had to return to the office for some urgent administrative paperwork, so the whole get‑together fell apart. Mike left and P'Wat started removing the filled gelcoat that he'd put on earlier (it was so soft that Jon could cheese it off with his thumbnail!) P'Wat worked half‑heartedly for an hour or so on the port sugar‑scoop before he also left, leaving the starboard sugar‑scoop untouched and still needing lots of work, and without any comment to us. So we didn't get any satisfaction on the preparation of the sugar‑scoops or cockpit, but we remain optimistic that it will happen. Mike won't let us down. Up on deck, Bank was absent but Yoong and Nut made great progress on the un‑doing of the gutter gelcoat. Baw joined the other 2 in the afternoon and together they got all the chipped areas faired back with orbital sanders, and masking put down where the non‑skid will go. This means that now we can walk around on the cabin top by stepping on the vinyl, not on the white gutter areas that will be the first to be gelcoated (again). One thing we did agree on with Mike was that those gutters (and any other areas to be sprayed with gelcoat) will have to be last minute sanded and acetone cleaned just before being sprayed. The sand in Coconuts Yard is pervasive, gritty, and light enough to blow onto the boats. And it doesn't make a good substrate for gelcoat! 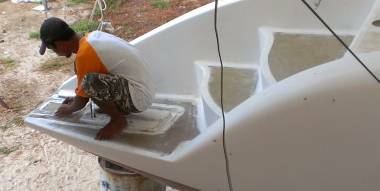 Baw spent the morning finalizing the transom work he started yesterday, trimming back the excess glass he'd laid down yesterday and sanding everything smooth. He then brushed on a layer of epoxy and spread a bit of phenolic epoxy filler around the edges. Sue spent a few hours with the mast spreader poles. She got all 4 of them sanded with both 400 and 600 grit. Her fractured arm is mended, but her wrist is still swollen and very sore from inactivity. She wore a latex glove over the blistered, raw skin, but it was not really fun. She retreated to the air conditioned apartment before 11 to work on income taxes. Is she nuts? What's more fun than messing about on your boat? Out of the frying pan into the fire. Amanda continued her education in boat plumbing today, assisting Jon in the creating of new faucet systems for the 4 heads. Could be she finds it more interesting than polishing aluminum. 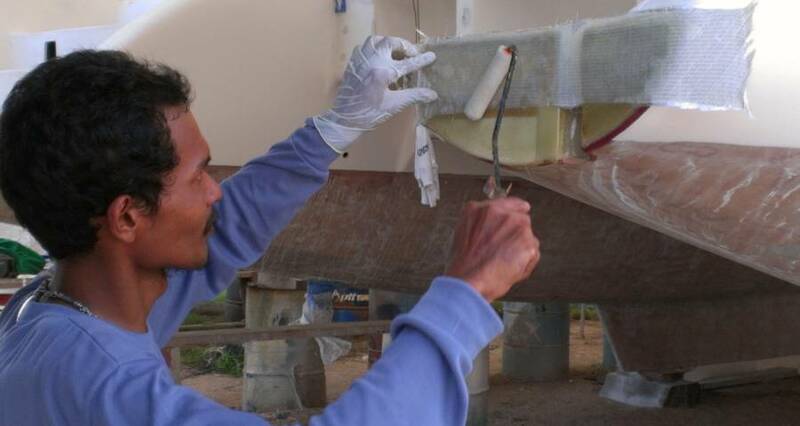 Lek and Pla were busy with 1200 grit sandpaper, wet‑sanding the starboard hull. Sometimes it feels like the movie Ground Hog Day on Ocelot. We had the guys sanding with 1200 grit on starboard a few weeks ago, then they found all the little pinholes that were missed, and backwards we went. We just hope there's enough gelcoat left after all this sanding! Houa sanded the cockpit table, and got it looking all spiffy. He imbedded new teak pieces where the old hinges had been, ready to receive the new stainless or plated bronze hinges once we choose them. The table will be stored away now until it's varnishing time. We don't trust the workshop tent to keep the rain out and it would be a shame to let the gorgeous new wood get stained. Jon and Amanda got a lot done designing the sink and shower plumbing for the heads. 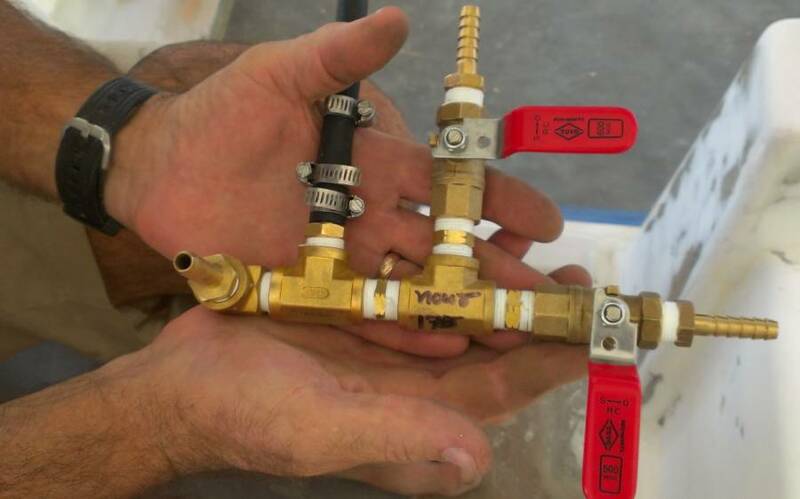 They had to bevel and sand the edges of several of the components so they'd fit together nicely, but in the end they had 4 mixing valves connected to all the necessary piping except the actual sink faucets (which double as the shower heads and still have to be bought). 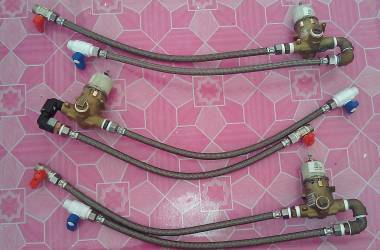 Once those are purchased, we should be able to install the mixing valves and connect them up to Ocelot's water system. At 4pm Jon and Houa left Amanda to keep an eye on the workers while they borrowed E‑U's truck to go into Phuket town. Houa has indicated that he'd like to buy a new $825 Ryobi Surface Planer, and he'll pay for it by having us withhold $35/week out of his pay, so we figured we should get it as soon as possible to begin the repayments. While Makita is usually the quality brand of choice here, Houa has more confidence in the Ryobi lasting longer than the Makita. He'll be making good use of it now that he's working with bigger pieces of teak, like for the lattice board for the anchor chain, and then the teak decking for the cockpit. End of the week approaching, and the rain last night cooled things off a bit. We were down to a manageable workforce today, with the Hacking Team of 3, plus Houa, Baw, and 3 workers: Yoong, Pla and Lek. We had asked to reduce the low end of our work force (Nut and Bank) as we are getting to jobs that need more sophisticated knowledge and less brute force and mass elbow grease. Lek and Pla carried on in their inimitable style. Pla found and prepped and filled a few more pinholes on the starboard topsides. (Oh, gosh, let these be the last!) 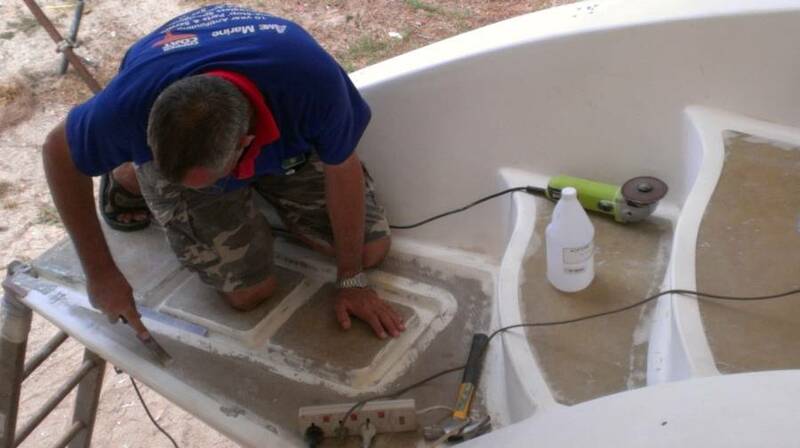 In the afternoon he sanded the small transom areas that Baw had glassed, and then added phenolic to smooth out the transom face. It was a bit more than the "nit noi" (a little) that we'd asked for but it can easily be sanded back. 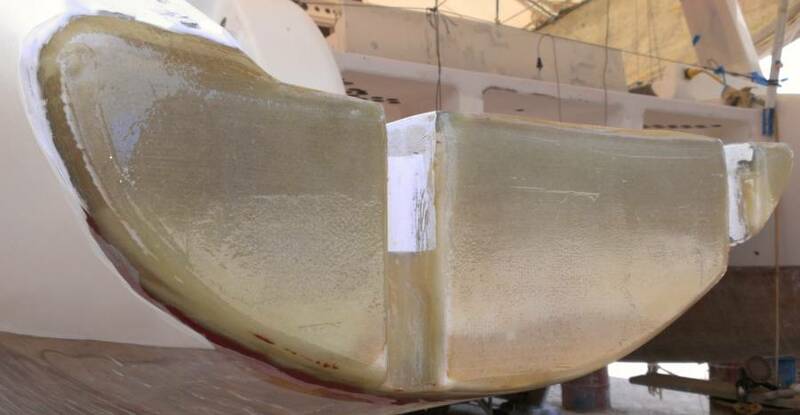 Lek wet‑sanded with1200 grit sandpaper on the inner aft topsides and under the lazarettes. Houa finished the beautifying sanding of the teak cockpit table, then Sue and Amanda wrapped the 2 pieces in clear plastic and hauled them off to the storage room for safe keeping. Houa then attacked the very worn teak lattice plank that divided out trampolines, and over which the anchor chain slithered and clanked for 18 years. He began by cutting out the lattice (now a decorative addition to the workshop!) and routering the thick teak into 2 pieces so that he can repair and replace. Jon took a scooter ride to town to get some hinges for the cockpit table, more plumbing supplies and 2 more fiberglass rods for the trampolines. In the afternoon he and Amanda worked on the trampoline lines. The rods that Golf put in last year were too short, and we decided we could switch the long ones to the short sides, and get new longer ones to fill the fore/aft slots on the insides of Ocelot's bows. Jon devised a clever way to file down the sharp ends of the 10mm (3/8") fiberglass rods: he placed one end in an electric drill, and with Amanda driving the drill Jon was able to turn the rod against a file and Voila! A rounded rod end! Sue and Amanda concocted several major "Things to Do " lists for Jon, themselves, the workers and things to be outsourced. 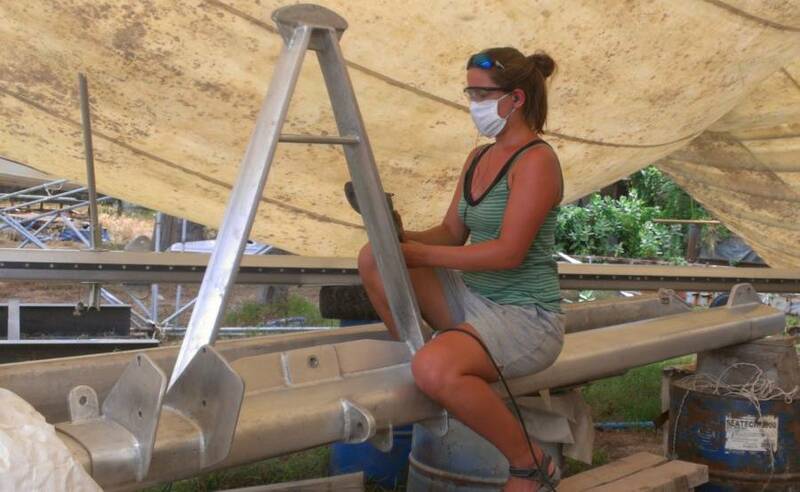 In the afternoon Sue attacked the spreader brackets on the mast with 400 grit sandpaper. Once we get Nyalic put on these, we'll be able to apply a full second coat of Nyalic to this (second) side of the mast, thereby declaring it DONE! Amanda brought up the 2 new diesel tank hatches and tried them out in situ, trying to work out how best to deal with the gelcoat and hinge issue. Good thing she did, as it turns out the port hatch doesn't fit anymore due to overly thick gelcoat in the hatch gutters. Baw set to work to right it, immediately. Baw and Yoong were the cabin top wizards today. 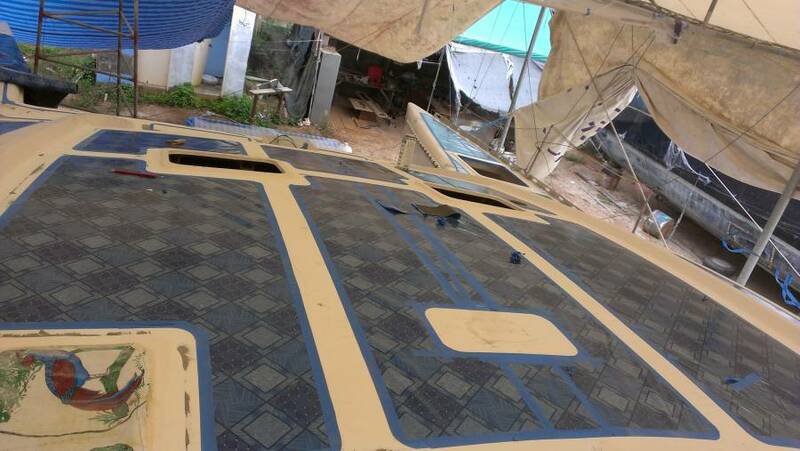 They finished masking the whole deck and cabin top in blue vinyl, such that only the "gutters" remain open. They had to re‑do a bit when Amanda pointed out that we had planned a different gutter pattern than they had created. Then they began hand‑sanding all the edges of the gelcoat where the "repair" layer will be sprayed so that it will stick! We kind of like the bright blue look of the nonskid areas, but of course, it's just temporary, and the nonskid will be more subtle and a LOT cooler under foot! When it rains it pours. Workers coming out our ears, and yes, rain last night! The seasons, they be a changin'. Sue and Amanda were early on the scene today to find Pla and Lek already at their stations, finding, cleaning, filling in, and sanding flat those darn pinholes in the gelcoat. Will it never end? At least by afternoon, only Pla was on pinhole duty, and Lek was busy polishing the small horizontal surface under the lazarettes. Yoong and Baw continued their careful wok on the cabin top and decks. Making sure they walked, stood, and squatted only on the blue vinyl, they cleaned areas that needed more filler, wiped them with acetone, then applied thin layers to fill the dips left after their chipping and sanding exercise. Mike and a team of 3 others from AME were on board most of the day. They have taken over the job vacated by P'Wat, and will be preparing our sugar‑scoops and cockpit for gelcoating. Mike was frustrated some of the day, as he found he was reshaping some areas that he'd thought only needed roughing up, and he discovered some soft filler under the Thai white gelcoat on the rim of the port sugar‑scoop, which will have to be taken off to ensure that everything under the new gelcoat is both strong and well bonded. Mike and his team sanded, both by hand and with a grinder, the "chocolate boxes" between the ladder grooves. This is the area that had not been properly cleaned and sanded last week. Once the bad filler was off and the glass and epoxy was sanded, Mike screed on thin layers of epoxy with a touch of filler and silica, to level the squares off so they're ready for nonskid. The other tricky part of AME's job is getting the ladder grooves properly sanded. Unfortunately, poor workmanship last year put blobs of epoxy resin in the bottom of some of the grooves which is very hard to get out of narrow spaces. The edges of the grooves are also made with biaxial glass, so there are threads standing proud of the glass which are very hard to sand down. This means there are bits of shiny epoxy/glass: a real no‑no when trying to get gelcoat to stick. 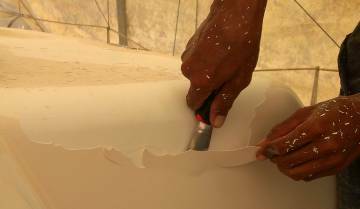 Mike came up with some innovative tricks with PVC pipe and sandpaper to try and knock back the threads and the shiny areas, but it's a bit more work than he'd bargained for. 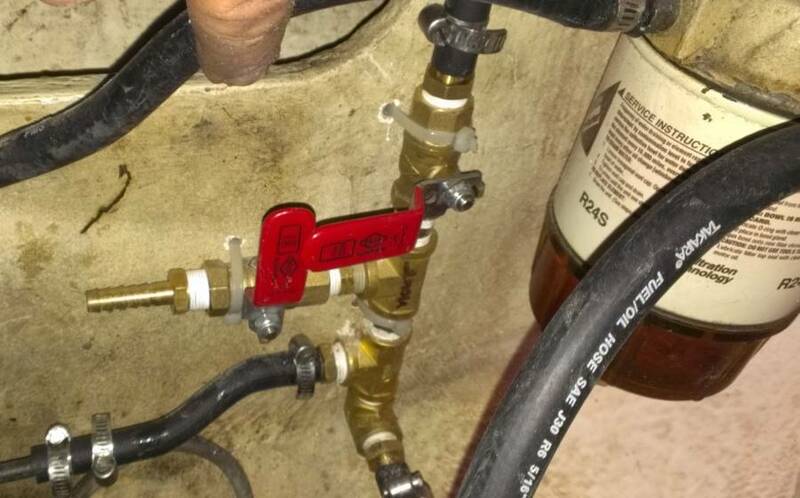 Jon got 10 new stopcocks installed in Ocelot's water system - 2 in each head and another pair under the galley sink. None of these had stopcocks before. Once he replaces the valves for the sugar‑scoop showers, we should be able to pressurize the water system again. Jon also installed the 2 new diesel manifolds next to the new forward diesel tanks. These only have 2 valves each - one controlling flow to the engines, and the other going to a clear vertical pipe that we'll mount next to the tanks so we can see how much fuel is in each one. Working inside those compartments is tricky. Jon only just fits down the new hatches, and once he's in there's not much wiggle room. Our diesel mechanic, Hem, came by in the early morning, all ready to hop down into the engine rooms and pull out the raw water pumps. This is a job Jon has been wanting Hem to do for months, and we didn't dare turn him away, even though we really didn't want anyone doing anything greasy today with all the sanding and cleaning going on. But Hem is a small guy, and he fit very easily into the emergency hatch opening on starboard side once we convinced him that it was a valid way in and out of the boat. Of course, once in the engine room, or under the aft bed, he completely disappeared, as he is so compact. Perfect person size for engine work, if you ask us! Hem will be taking the pumps to his work shop to change the impellers from Jabsco (which only last about 200 hours) to real Yanmar impellers, which are 3 times as expensive but they last way longer. He'll also be changing the seals, as he was unable to get new ones when he did the work originally. Finally, we want him to install some interesting oil filters for us. These use a roll of toilet paper as the filtering element. When we change our oil, we can't get all of the oil out, and the oil that's left is the really scrudgy stuff. Even immediately after an oil change, our oil looks dirty. These adjunct filters should clean all that scrudgy stuff out of the oil so the oil looks clean and golden. Houa spent his day working on the chain lattice. He got the side pieces routered off, and then had to pull all the small tacks out one by one to prepare to chisel and router out the places where the lattice attaches to the sides. Like our teak table, the whole thing will be looking bad and worse before it looks better, then beautiful! With Jon's birthday looming tomorrow, we threw a little party at the yard. We thought we'd do it at 2:30, with the idea that the workers could take a much‑needed break from the hot, dusty work, then get back into it. Well, it sort of worked... Sue and Amanda scootered out for the fresh coconut macaroons (the size of tennis balls, and moist and dense! ), ice cream cups, and bottles of sodas and iced tea. When they returned to the yard, though, and laid it all out, Mike and his team had just mixed epoxy so they couldn't stop, and Baw had gone off on some errand with E‑U. But we did get a few of the guys together for a little Happy Birthday song (Houa must have sung it 20 times all day!) and some ice cream enjoyment. Amanda worked on polishing the forebeam, again. She had done it a few months ago, but when sue sanded it, they could still see a gazillion tiny pinholes or dark pinhead‑sized spots, which the sanding didn't remove. So Amanda tried again, and sure enough, with enough patience she could get 90% of the dots out. We'll feel better knowing that there is very little corrosion under the Nyalic. The goal is still for Sue and Amanda to go to the yard tomorrow (yes, on Jon's birthday!) to get a second coat of Nyalic on the whole length of the mast (on the side they did over the past 2 weeks) and on the spreader poles and the spreader bases that are on the mast itself. Sunday morning plans include Jon staying in the air conditioning to talk to family on Skype. The women will do the Nyalic work at the yard. Then a quick brunch at Flint's One (our tradition) and off to Ao Po (NE Phuket) for an afternoon and evening of cruising buddies and a pool party. Jon's Birthday! So guess who got to hang at the apartment and talk to his dad and son? Yep, Jon had a lovely morning chatting with both Colin and Chris. What a shocker -- Chris had been skiing in a snow storm all day! Given that it was a Nyalic Sunday, Sue and Amanda had tea and a Linzer Torte, then headed for the yard. They had everything already organized and ready to grab from the locked work box, so they didn't have to even get on the boat. While Amanda washed the mast, Sue sanded the spreader poles one last time. Interestingly, they didn't like 1000 grit paper, which turned them a dark color, so she used 600 grit for the final sanding. After hanging the poles (vertically) they washed and dried them, then dried the mast. Then back to the spreaders for an alcohol wipe before putting on the Nyalic. After finishing the spreaders, the mast got an alcohol wipe down. Sue and Amanda used 2 brushes, wrapped in clean sheeting, and did a double run the full length of the mast, getting on a good second coat of Nyalic. It looks gorgeous! Team Hacking had their standard Sunday Brunch at Flint's One Bakery, then headed north to Ao Po for the party festivities. We had rented a car, so we could take stuff for swimming, sangria makings, and stuff for spending the night. We had a fantastic afternoon and evening with 6 other cruising friends at a beautiful apartment with a stunning view and an infinity swimming pool. We all walked to the little Muslim village on the waterfront for a fantastic seafood dinner of crab, fish, soup, rice, veggies and prawns, with several different sauces in which to dip things. Then came the first dessert of fresh pineapple and watermelon, and mango slices on coconut cream and sweet sticky‑rice. YUM! Stuffed. But not too stuffed to enjoy the ice cream and homemade carrot cake with cream cheese icing cooked especially for Jon by Alene! What a great day!